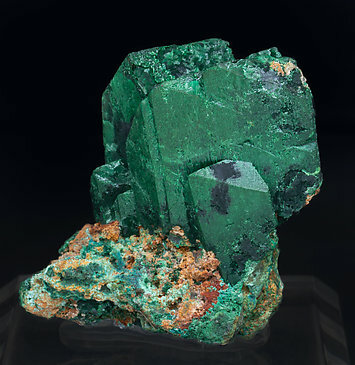 This is a single, sharp, doubly terminated floater of Malachite pseudomorphous after Azurite, apparently simple, but the polycrystalline growths are full of interesting details. 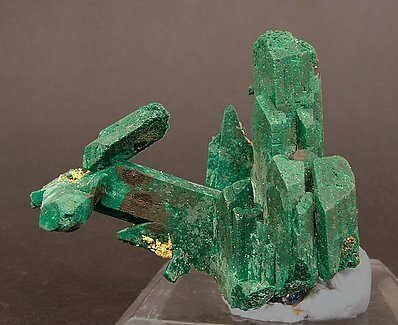 Pseudocrystals of Malachite after Azurite in parallel growth on a matrix of fibrous Malachite: bright, with very rich color. 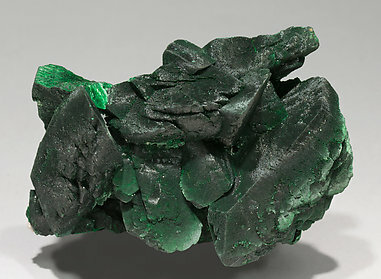 A silky mass of flattened Malachite crystals, pseudomorphous after Azurite, with very well defined faces and edges. More elegant than usual. 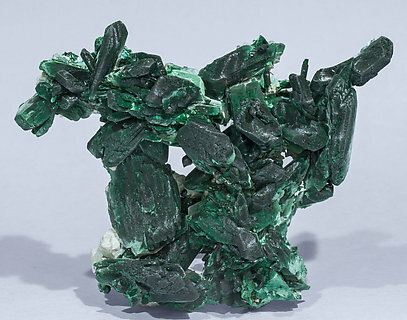 Group of Malachite crystals pseudomorphous after Azurite, with very well defined faces and edges, some of them doubly terminated and with a velvety aspect on the surface of their faces. 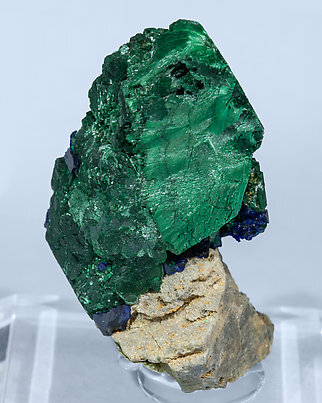 This is a group of pseudocrystals of Malachite after Azurite, one of them clearly dominant, with very well-defined faces and edges and a very deep color, partially coated by fibrous Malachite. 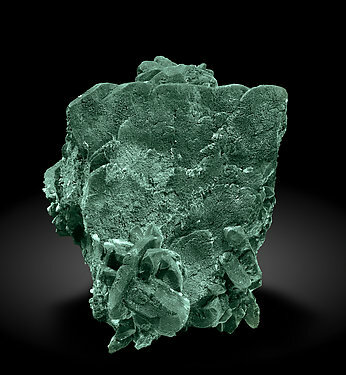 Drusy bladed Malachite crystals, pseudomorphous after Azurite, forming rosettes which have very well defined faces and curvatures. They have a very deep color and a silky luster. 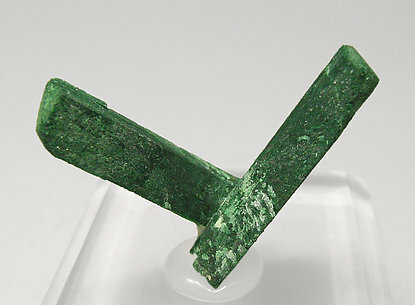 Very aerial parallel growth on matrix of Malachite after Azurite crystals that are flattened and very sharp with very well defined faces and edges. An excellent Bisbee classic that is very well documented by labels of the Richard Graeme and the Lee Hogg collections, labels that we will send to the buyer. 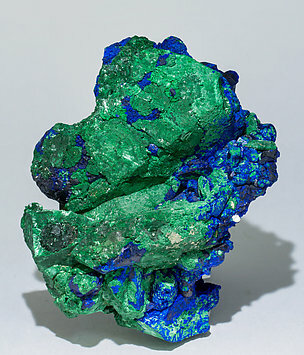 Aggregate of Azurite crystals that have an unusual morphology for the locality. They are blocky, very large and have a very good crystalline development. 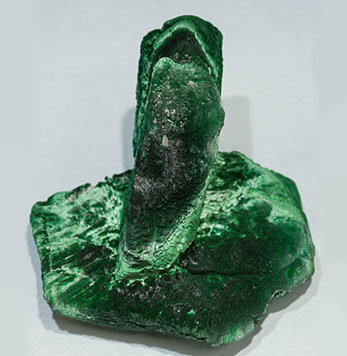 They are partially coated, and in some areas pseudomorphed, by Malachite. On the back on the sample there are vivid blue, roughly defined, Azurite crystals typical of Bou-Bekker, this fact proving its source. 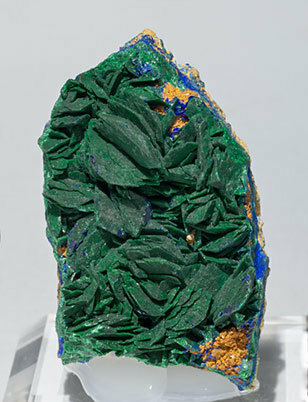 Aggregate of lenticular Malachite crystals pseudomorphous after Azurite, with very well defined faces and edges and on matrix, with Azurite and Malachite. As is the case with so many specimens in this collection, the sample is of great quality for the locality. 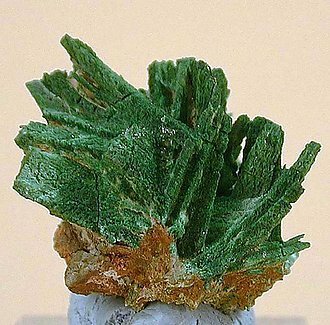 Group of divergent sword-shaped Malachite crystals pseudomorphic after Azurite. With some small Azurite crystals as a matrix. Very esthetic. 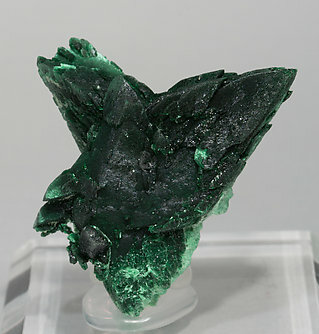 Thick Malachite crystal with multiple terminations and on matrix. 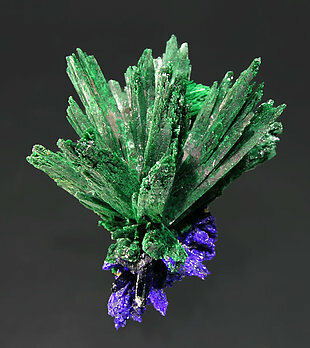 A primary Azurite crystal has been totally replaced by Malachite. 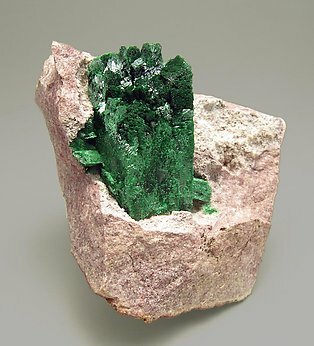 Aerial sample of Malachite pseudomorphous after Azurite. They have a very deep color, an excellent luster for the species and the biggest crystal of the former Azurite is doubly terminated. 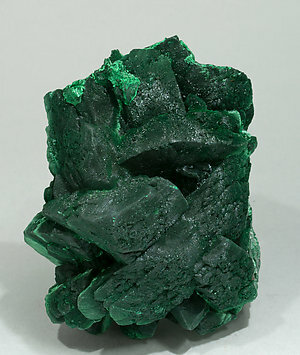 Aerial group of Malachite pseudomorphous after Azurite crystals, with rounded faces and edges, a very deep green color and silky luster. 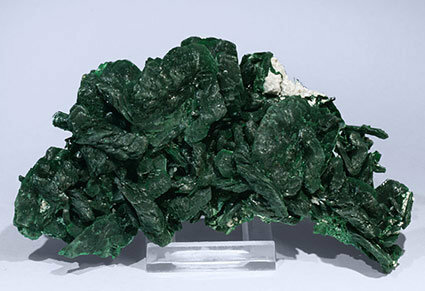 Very aerial group of Malachite pseudomorphous after Azurite crystals, with slightly rounded faces and edges, a very deep green color and a silky luster. 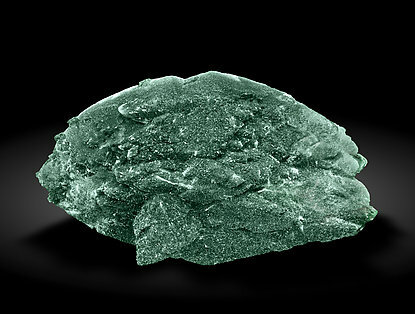 Aggregate of Malachite crystals, pseudomorphous after Azurite, which have very well defined faces and curvatures. They have a very deep color and an excellent luster for the species. 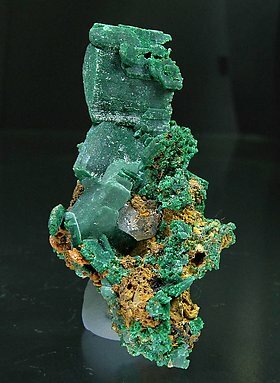 Aggregate of thick and large crystals, some of them doubly terminated, of Malachite pseudomorphous after Azurite. At the bottom are fan-like aggregates of fibrous crystals with a clearer color. 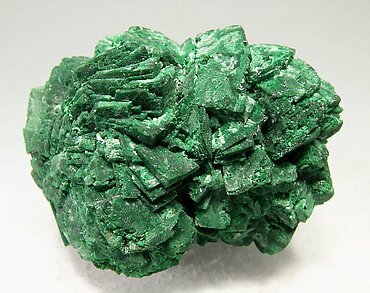 Aggregate of thick Malachite crystals pseudomorphous after Azurite whose faces have a fibrous aspect and silky luster. They are very well defined and sharp, especially considering they are pseudomorphs. 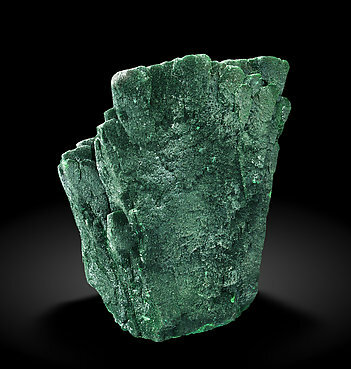 Malachite has replaced completely the prismatic crystals of the original Azurite, while perfectly preserving their esthetic shape, on a matrix of Limonite. 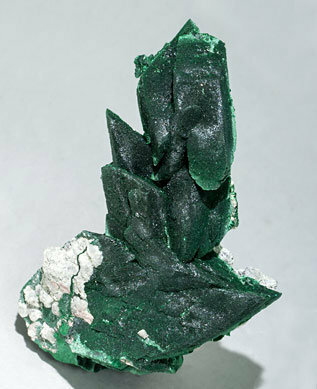 Crowded growth of Malachite crystals pseudomorphous after Azurite with minor Limonite fragments. The piece is from an Australian locality that is very rarely represented in worldwide collections. Group of unusually sharp prismatic crystals on limonite matrix. They are doubly terminated and one of them is clearly dominant. The sample, of great quality due to the perfection and sharpness of the crystalline forms, has a small geometric contact on one of the terminations of the main crystal, a contact that we clearly show in the close-up photography. 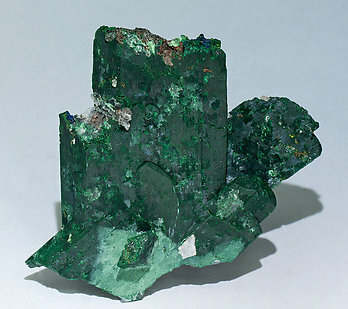 A growth of two divergent crystals, one of them doubly terminated, with very well defined faces and edges, pseudomorphic after Azurite and with surface silky fibrous recrystallizations. 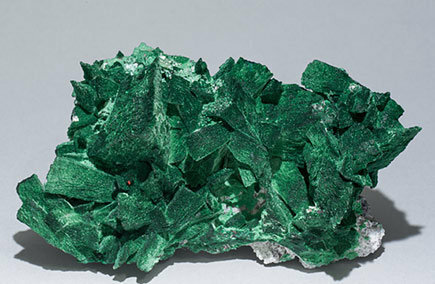 Aggregate of flattened Malachite crystals, pseudomorphous after Azurite, with parallel growths and a silky surface. In some areas the replacement has not been complete and the primary azurite is preserved. A classic from Tsumeb that is with a Jack Crowley collection record card that we will send to the buyer. What form! Just as esthetic as the photo suggests, this is a floater which comes from a highly respected private collection. You can really see the good taste of the former owner: a real beauty! 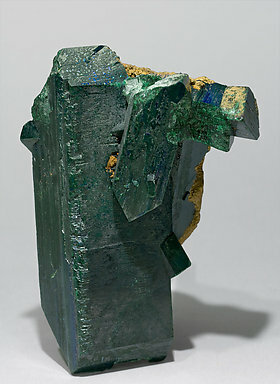 Parallel growth, on matrix, of very sharp Malachite (after Azurite) crystals. They have a silky luster and as an added feature there are small, very bright Azurite crystals. A classic from Tsumeb, very esthetic, that is from the Lee Hogg collection whose label we will send to the buyer.